The major threat to the survival of omnipresent bacteria is the much simpler viruses. Viruses are strict parasites with extremely simple organisation just the genetic material either DNA or RNA surrounded by a protein coat. Viruses that attack bacteria are called as bacteriophages. Bacteriophages are the group of viruses involved in transfer of genetic material from one bacterium to the other. Such virus mediated gene transfer is termed as transduction. The carrier phage is the transducer or vector. Transduction was first described by Joshua Lederberg and Norton Zinder in 1952. 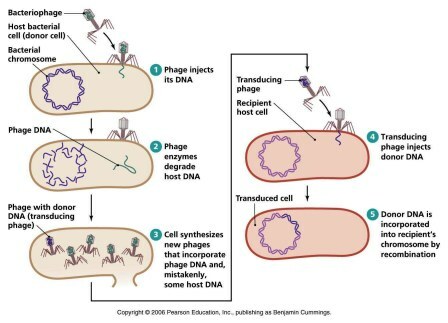 Bacteriophages are widely used as vectors in recombinant DNA technology. Different types of transduction: generalised (random) and specialized (specific DNA fragments). To understand transduction in detail, we need to understand the lytic and lysogenic cycle of bacteriophage replication. 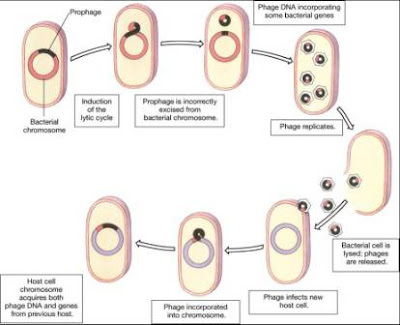 Generalised transduction is mediated by lytic phages where any DNA segment can be transferred by the virus and may not integrate the segment to the bacterial chromosome. Here a portion of the donor bacterial DNA accidently gets enclosed in a capsid. Upon lysis and further infection of this virus particle to another bacterium, the genetic material of the donor is released and recombination occurs between the injected DNA segments and homologous part of the recipient chromosome, forming a rDNA. Generalised transduction can be either complete or abortive. In complete transduction, the exogeneote or the transduced DNA fragment gets integrated within the recipient bacterial chromosome (endogenote), forming a recombinant chromosome. This DNA fragment, replicate along with recipient bacterial chromosome replication and passed on to the daughter cells. In abortive transduction: the exogenote may not get integrated with the endogenote and remains in the cytoplasm as free particle. These fragments cannot undergo replication. Specialised transduction is mediated by lysogenic phages. Here specific DNA fragment are integrated into the host chromosome. Here phage DNA gets integrated with the bacterial chromosome, viral genome integrated into the bacterial genome is called prophage. The prophage undergoes replication along with bacterial genome replication. Upon induction, the propahge detaches from the bacterial chromosome. At times, a portion of the bacterial DNA remains attached to the detached phage DNA. 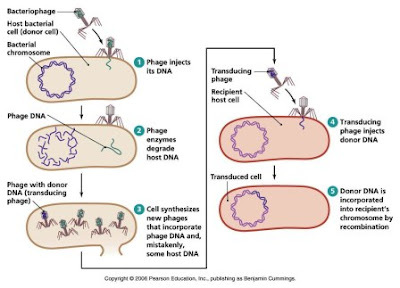 This excised phage DNA undergoes lytic cycle and infects another bacterium and transfers the bacterial genes from the donor bacterium. Here only the bacterial genes that are close to the site of prophage are transferred. So this transduction is called specialised. Lysogenic phages like lambda phages are widely used as vectors in rDNA technology.